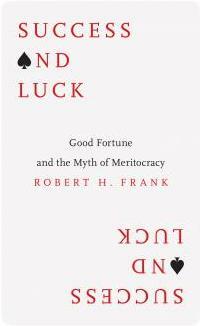 Cornell economist Robert H. Frank has written a new book: Success and Luck: Good Fortune and the Myth of Meritocracy. In this book he explains that luck plays a bigger role in achieving success than we usually realize and especially the luck to have been born in a prosperous country. People differ in the degree to which they realize that their success is not only based on their own abilities and effort but also on other, external, factors such as luck. People who are more aware of this generally feel more grateful and are more prepared to pay higher taxes. People who attribute their success to a large extent on internal factors such as effort and ability and to a lesser extent to external factors such as luck generally feel less grateful and are less willing to pay higher taxes. Frank's message is especially urgent for the American situation but could also be a warning to other countries. In spite of what Donald Trump thinks, taxes are relatively low in the US compared to many other prosperous countries (such as many European countries). Skepticism about the usefulness of higher taxes is relatively high in the US. As a consequence, many collective goods such as infrastructure have deteriorated a lot over the past decades. Increasing taxes in the US would be good. By investing in public goods a basis would created for future prosperity. Also, feared disadvantages of tax raises are overrated. One fear is that a tax raise will lead to a bigger government and that this will hurt the economy. But when the government will invest tax money into infrastructure this will mainly have positive effects on the economy, not only in the long term but also in the short term. These investments will create jobs for people who may now be unemployed or earn lower wages. This new group of workers will have an increased purchasing power and which will increase consumer demand and therefore support economic growth. It is myth to think that government spending is by definition wasted money and bad for the economy. Also the argument that a tax raise will lead to a decline in purchasing power and therefore is bad for the economy is not valid. If you, as an individual, are fired that will hurt your income and will be a problem for you. However, if a tax raise causes everyone's income to decline the relative purchasing power of people will not change much. And it is the relative purchasing power which will determine who is able to buy what. A tax raise will, to a much lesser extent than people think, influence what they will be able to buy. The book deals with several other topics which also are dealt with in other books by Frank such as the luxury fever effect and the benefits of a progressive consumption tax. As is nearly always the case with Frank he has again written an interesting book. I hesitate whether his emphasis on luck is fully justified. The core of his argument does not seem to rest on the fact that we underestimate the influence of luck on our own success but that we overestimate the influence of internal factors and underestimate the influence of external factors of which luck is only one.